Glenn McLaughlin studied chemistry, education, running and dishwashing, but not writing or poetry, at Bucknell University. After nearly thirty years of laboring in the chemical and plastics industries, he was fortunate to lose his job and begin a journey that has lead him, finally, to where he should have been all along, a high school classroom. He currently teaches chemistry and physics at Methacton High School. While not formally trained in poetry, he has published two collections of poems, Something Catches (2006) and Forms of Lectio (2008), the latter a finalist for the Eric Hoffer Award in Poetry in 2009. 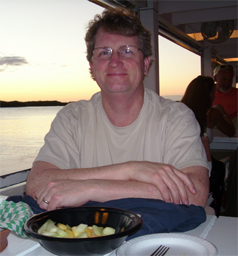 Several of his poems have been published in the Schuylkill Valley Journal, The Mad Poets Review, Forward and Big Bridge. Volumes of poems and essays, The Land I Am Given / Oops and Observing Changes in Enthalpy were published in 2011 and 2013. Additional honors include two Spring-Ford High School Senior Impact Awards (a student nominated award for teachers who students believe make a difference) and election to the Bucknell Athletic Hall of Fame. He lives in Pottstown with his wife, Susan, and is an easy drive away from his two daughters and four granddaughters.